The Department of Public Works and Highways (DPWH) under the administration of President Rodrigo Duterte recently completed the major rehab of the 1.14-kilometer section of Makilala-Allah Valley-Mlang Road in North Cotabato. 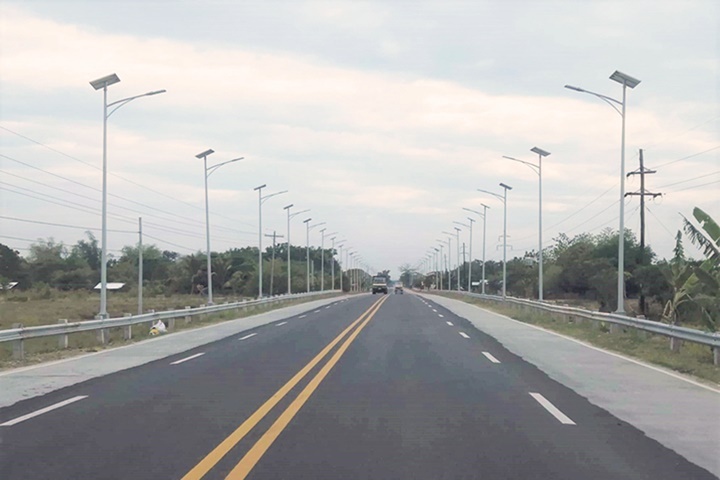 According to DPWH Secretary Mark Villar, a total of P44-million was allocated to implement the road improvement project which involves asphalt overlay and provision of solar-powered street lights. “Serving as a connection to Maharlika Highway, the newly-improved Makilala-Allah Valley-Mlang Road will serve thousands of motorists and farmers who grow and trade agri-industrial products in the province such as rubber, rice, coconut, coffee, banana, and durian,” said Secretary Villar. Solar-powered street lighting is also a free, eco-friendly feature that will ensure safety of the commuters and pedestrians utilizing the road at night time. “We are pushing for the inclusion of street lights in our road projects nationwide, especially in dark areas where there are no proper lighting coming from houses and establishments. In these cases, street lights are vital in preventing the occurrence of accidents,” added Secretary Villar.